Structural, electronic and optical properties of different phases of tin sulfide SnSx (1 = x = 2) have been theoretically estimated by modern potential and approximation techniques (modified Becke-Johnson, GW approximation) beyond the density functional theory. All phases were found to be indirect-gap semiconductors. 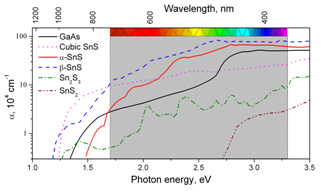 The room-temperature simple orthorhombic a-phase of SnS is characterized by the energy gap of about 1.2–1.6 eV, while the high-temperature C-centered orthorhombic ß SnS has a smaller gap of about 0.6 eV. The cubic phases which were experimentally observed in thin films possess a gap of about 0.7 eV, while the largest band gap, i.e. 2.4 2.9 eV, was found for hexagonal phases of SnS2. The averaged absorption coefficients (> 105 cm-1 in the visible spectrum) of cubic or orthorhombic phases of SnS were found to be around one order of magnitude with that of GaAs. This shows a-phase of SnS to be promising for photovoltaic applications.